Our success lies in our human capital. A happy employee will make a happy customer. Equality, Achievement and Team Work is the key success factor for enthus iastic employee. Let's make Gistex the best place to work for... and a place to be proud of. Our success lies on how much contribution each of us make each day, each hour and each minute. Star contributing... and We will never miss the future. Our family business established in 1975. Our main building and plants arelocated in Bandung. Indonesia. We first started as Gistex, and primarily produced commercial spun weaving fabrics : T/C, cotton, rayon, etc. Install Capacity : 1.2 million yard/month. We established spun dyeing / printing / finishing mills with technical know-how from Nitobo partners. Install Capacity : 2 million yard/month. Modernization of our spun dyeing, printing and finishing facilities to penetrate the world market from home market. We started to export our spun fabrics for various export market. Within 10 years, we grew to become a reliable spun-supplier for local market and as one of the leading textile producer. Lagadar and Nanjung Processing Unit began operations of a polyester weaving & processing with Sunkyoung know-how. Install Capacity : 1 million yard/month. Polyester processing plant is opened with capacity 1 million. We installed 144 sets of shuttle looms to increase polyester weaving. Installed Capacity : 1.2 million yard/month. We established a new polyester processing plant to upgrade product capacity. 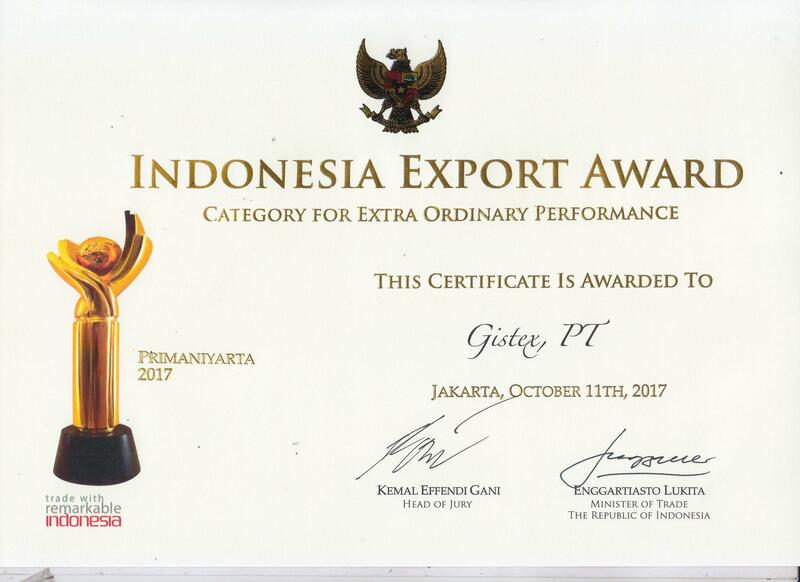 We acquired a "Primaniyarta Award" from the Indonesia government as "The Highest Achiever In non-Oil & Gas Exporter". Purwakarta Weaving Unit is completed with another new polyester Weaving Unit in West Java Indonesia. We executed a number of projects to expand Lagadar Weaving Unit and Lagadar Processing Unit. We established Gistex Chewon Synthetic (G & C) with other Korean and Japanese Company to produce special texturizing yarns and special high-twisted fabrics. Install Capacity : 400 ton/month. We official launched Gistex Nisshinbo Indonesia (G & N) as an alliance with Japanese Company to Specialize in cotton dyeing. Install Capacity : 2.5 million yard/month. Lagadar Weaving Unit equipped more facilities to produce high twisted and high quality spun or filament fabric using natural yarns. Nanjung Processing Unit modernized its production lines to process high quality viscose fabric and other special spun fabrics. Install printing capacity 500.000 yard/month. April 2000 Achievement: "Asean Development Best Economic Executive Awards 2000-2001" All units are certified for the ISO 9002. Lagadar Processing Unit increased additional dyeing and printing. Install Capacity : 3.5 million yard/month. Weaving polyester capacity increased to 1.6 yard/month. G&C Unit in increase capacity to 1.000 ton/month. Gistex bought some new machine for production support. Dyeing unit is upgraded. In this time, Gistex installed some new machine for integrated Dyeing Production System. We continuosly upgrade the machine and the building and also, Gistex Nishinbo Indonesia apart from Gistex with processing capacity achieve 3 million yard/month and weaving production result has been achieved 2,3 million yard/month. 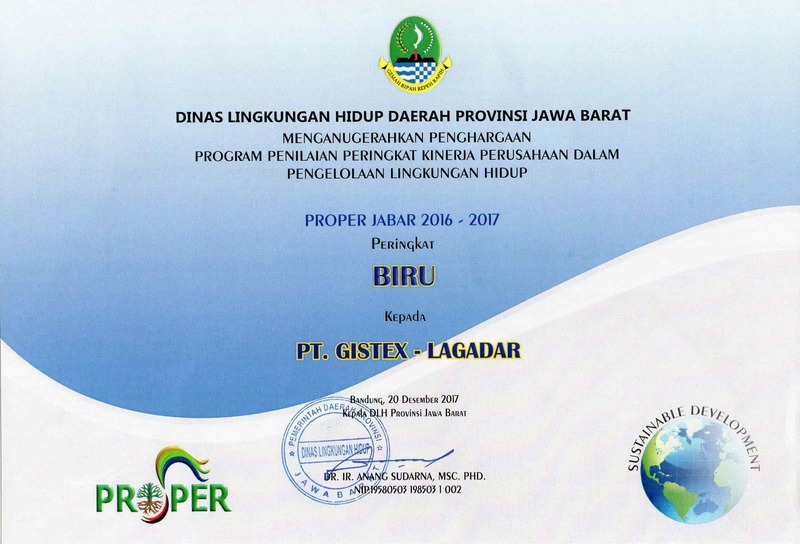 We commit to get Green Proper from Ministry of Environment Indonesia. This period is a business resurrection of Gistex. We kept replacing old machines with new technology to improve the quantity and quality of the fabrics production. Gistex launched 3 million yard/month production capacity and it reached 2.9 million yard/month. Gistex's markets are primarily Midde East and Europe. From year to year Gistex is striving to be a greener industry. "Gistex Go Green" is a proof of its concern to environment and a willingness to do more things to help the environment, both inside and outside the company.